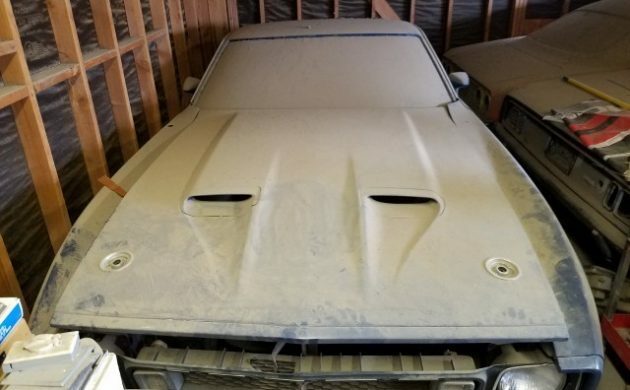 By 1973, the Mustang was virtually unrecognizable when placed beside the car that had emerged from Ford only a few years before. However, while we can be quick to condemn the Mustang for the way that it grew, it is by no means an unusual occurrence. For instance, if you compare a current Toyota Corolla with a Corolla from 1973, the current car has expanded in every dimension. 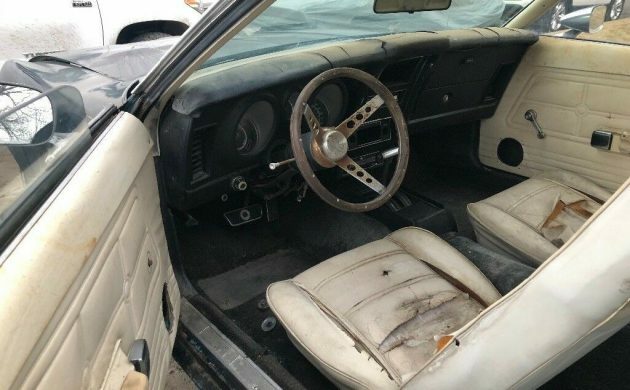 So, by 1973 the Mustang had grown from a lithe pony car into a luxury coupe. 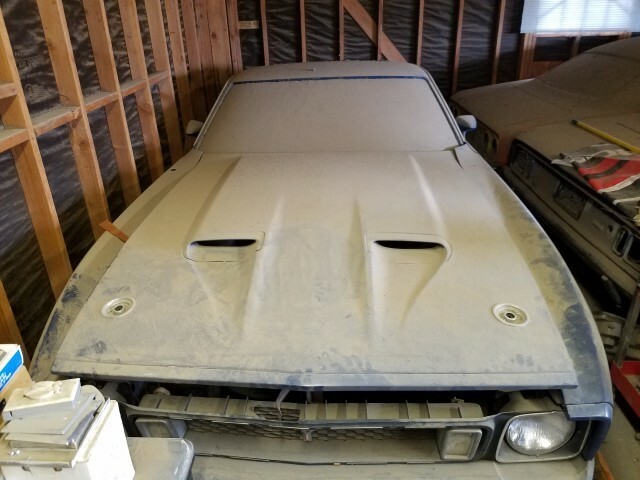 This particular Mustang is a car in need of restoration, as it has become a sad sight. Located in Pocatello, Idaho, it is listed for sale here on eBay. The first thing that I will say is that I can’t believe that someone decided that this Mustang really needed a color change. 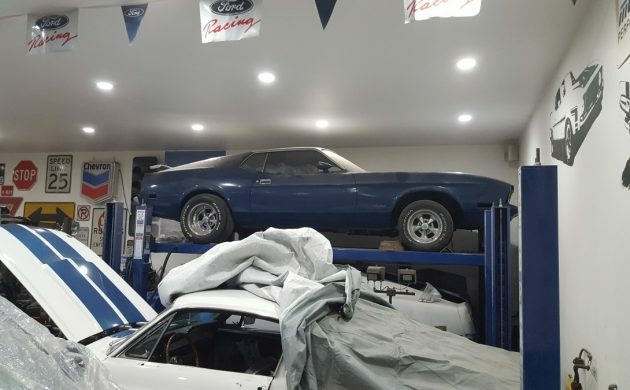 To some people, the ’73 Mustang might not have been the most attractive of cars, but painting it in a dark color (apart from dark metallic blue or green, or black) does it no favors at all. The car would have looked quite attractive in its original Medium Aqua, but then, I guess it probably seemed like a good idea at the time. There is some of the usual Mustang rust visible around the car, including around the rear wheel arches. The lower quarter panels actually look okay, as do the rockers. 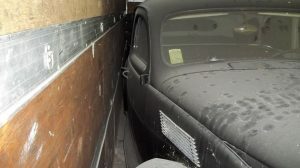 We don’t get any indication regarding the state of the floors or frame, but the owner does say that he has a replacement fender and grille to replace the damaged items on the car. 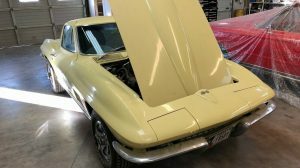 Under the hood is the 351ci 2V engine, which sports power steering and power brakes. Hooked to this are an automatic transmission and a 9″ rear end. Once again, this is not a combination that is likely to set your pulse racing, but it is a combination that is incredibly reliable. The engine is the original unit, and it doesn’t currently run. 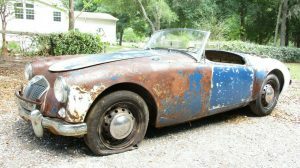 The car has been in storage for a number of years, but if the engine isn’t locked, it might not take much to kick it back into life. The state of the interior holds no great surprises for me. It is typical of cars of this era to have holes cut in the door trims for aftermarket speakers, and that’s the case with this Mustang. The original radio is also missing, which would indicate that there has probably been a radio/cassette player fitted at some stage. The interior is going to require complete restoration, but I have to say that the white trim matched with the original Medium Aqua paint must have been a nice combination when the car was new. 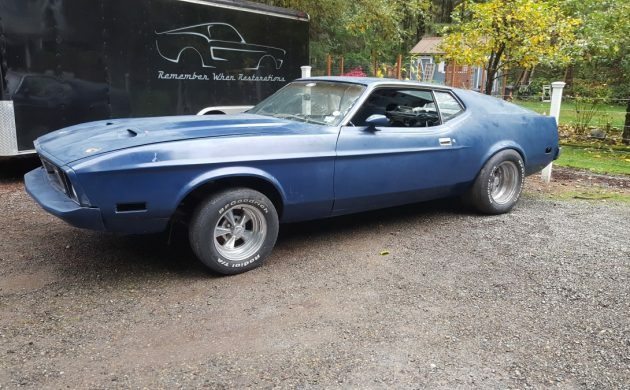 Alright, it’s not a Mach 1, and as the owner puts it, it might not be the most desirable of Mustangs. However, there are people out there who really like the style of the 1973 Mustang. Production of the Mustang peaked at 607,000 cars in 1966, and even though many people criticized the 1973 model, it still managed to achieve sales of 135,000 cars. That indicates that someone liked them…and people still do. An immaculate example can fetch anywhere from $16,000 upwards, and while that is not mega-dollars, it’s still respectable. 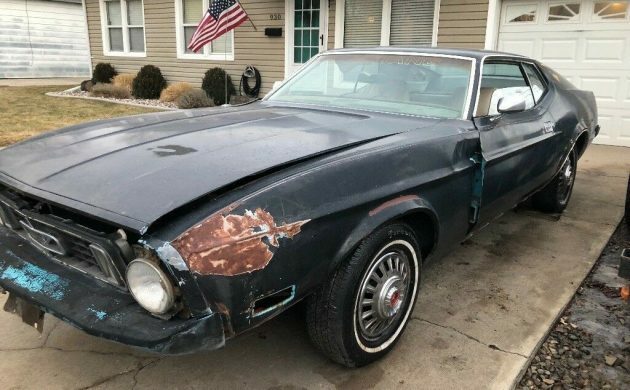 The owner of this Mustang has set a BIN price of $2,800, but there is the option to make an offer. That seems like a pretty competitive price for a complete Mustang that doesn’t appear to be a complete basket case. A friend from school picked up one of these back in the day, and we gave him a lot of ribbing about his new ‘land yacht’. He was quite proud of the interior and trunk space. Honestly, has any sporty car model been improved by being made larger and heavier? When I was a kid I had a Matchbox ’73 Mustang Piston Popper. I thought it was the coolest thing ever. Love these! 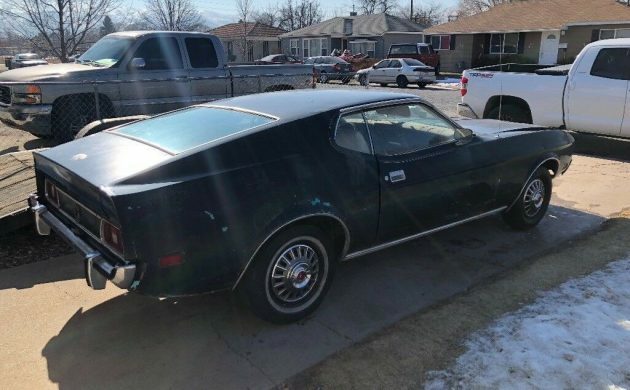 I had a 73 mach 1 in high school. Just recently found it tucked away in a garage where it had been sitting for over 30 years! Wont ever sell it again. Great! How did you locate it? Wow! Not sure why it posted multiple times?? Always wondered what happened to it after i sold it. 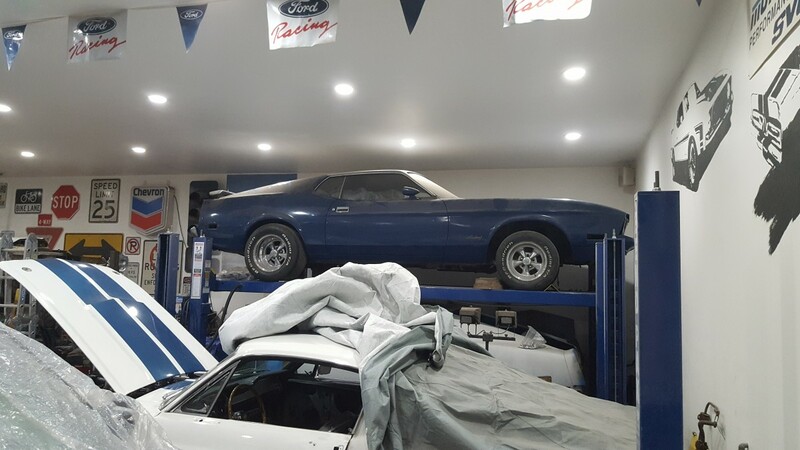 3 years ago i posted on 7173 mustang forum asking if anyone had seen it. It wasn’t until just a few months ago i received a response from the owners. 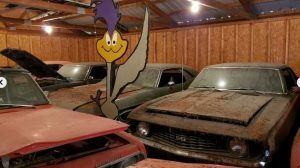 The mach 1 was stored in thier friends’ garage for over 30 years. They had to move it and bring it back home to Vegas. They googled the VIN and my post from the forum popped up. They were not really interested in selling it but i offered them the deal of a lifetime and i got to bring it back home. It’s next up for restoration. Love this style. 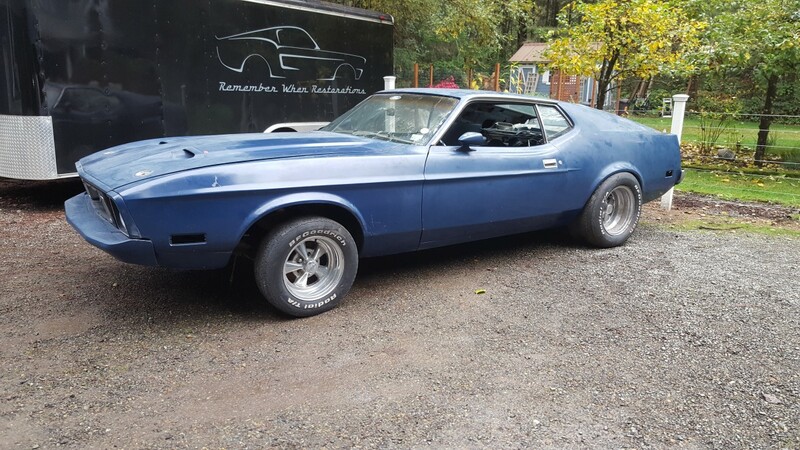 I Had a 73 mach 1 in high school, sold it after i graduated to buy a 70 mach 1. Just recently found it sitting in agarage in Las Vegas for over 30 years! Bought it back. Won’t ever sell it again! the last large mustang. Cheap enough and don’t underestimate the 351 c/ 2v/ auto. Neeed to look at every square inch for rust. Being from Idaho sure didn’t hurt!! Not the rottenest one I have seen on bf. You could get rid of the big bumpers and go with 71 or 72 bumpers. Good luck to the new owner. 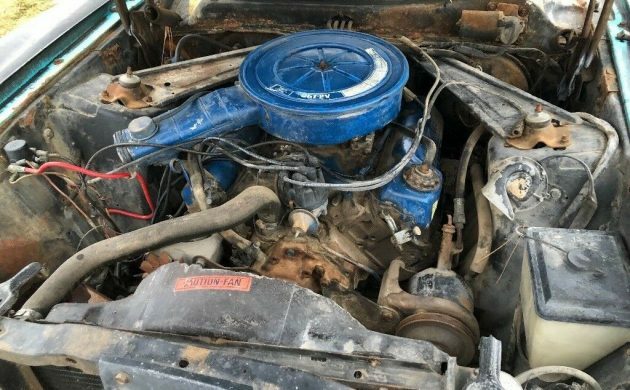 Of course these were bigger, Ford absolutely wanted the 385 series big block to fit this time, it was in design when big inch pony cars were fairly common. The seventies kinda fizzled out, not sizzled, so one model year and that was it for the big 429. Absolutely agree to never underestimate a 351 Cleveland, and no joking here but what came out in ’74 was a kick in the groin to any enthusiast who liked Ford’s. This one’s not pretty…yet. 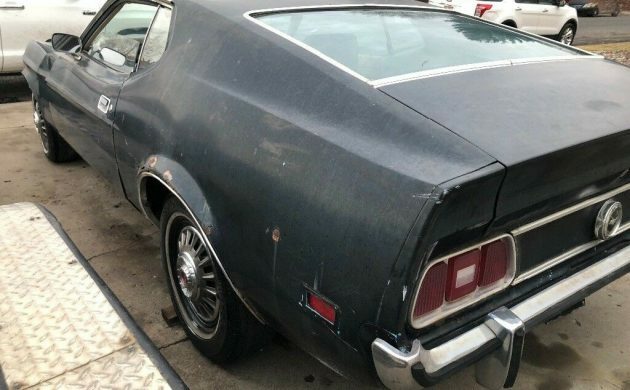 These car have always been just plain ugly to me, I loved the 69 & 70 body style… I can remember the first time I saw one and thought “wow that is one ugly car”….however I would much rather have a 73 over the 74 Pinto based smaller mustang piece of junk that I did own.